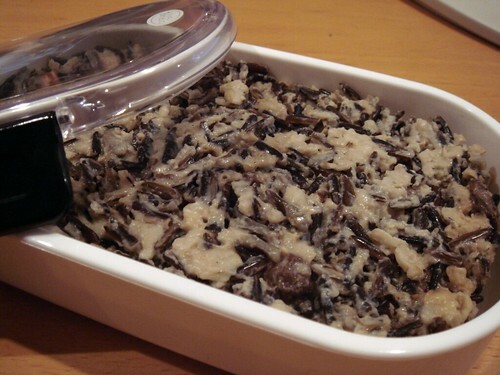 This post is actually more appropriately titled "how I learn to cook wild rice". We hear the health benefits of whole grains often and wild rice is of course one of those much touted good grains. Growing up in a modern Chinese household, my idea of cooking rice obviously involves an electric rice cooker (fuzzy logic and all...hey that would make it an electronic rice cooker!). Cooking rice over a stove top is simply not done at my home. Who wants the uncertainty of stove top cooking when it is a task easily handled by the trusty rice cooker? It was with much trepidation that I cooked my first batch of wild rice over stovetop. The instruction clearly said a water to rice ratio of 3 to 1. Sounds simple enough. The Mahnomin Porridge at Minneapolis' Hell's Kitchen opened my eyes to how delicious this grain can be so I was inspired to make my own version at home. However, for everyday eating, that was plenty of cream and syrup. I decided to cook the wild rice in almond milk for richness (without all the calories) and threw in emptied vanilla beans for good measure. This was where I committed the number one mistake of cooking from recipe. I didn't read the instruction to the end which clearly stated "drain the cooking liquid". I certainly wasn't about to drain away vanilla almond milk! Staring at my pot of soupy (abeit delicious smelling) wild rice, I came up with a good idea...oatmeal! With the addition of oatmeal, the porridge thickened up nicely to exactly what I was hoping for. Hooray for another healthy breakfast option! In a medium pot, bring wild rice and almond milk to a boil. Add in vanilla bean. Turn the heat to low and simmer for 45 minutes until rice is almost tender and split open. Add in rolled oats and raisins. Continue cooking until thicken, about 5-10 minutes. Serve immediately with a splash of cream, maple syrup, and toasted nuts for a more decadent taste. I've been on a weekly soup making schedule lately and learning to cook with legumes. 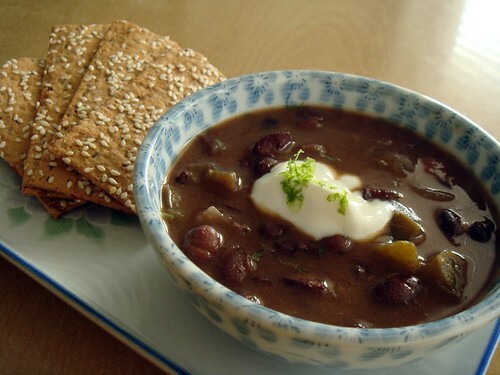 This southwestern influenced soup is hearty enough for a meal. The flavours of cumin and chipotle remind me of chili. Probably project in the near future. Soak beans in water overnight. Drain the beans of soaking water. Set aside. In a large pot, sautee onion, peppers, garlic, chipotle, and cumin until browned and fragrant. Add chorizo and sautee some more. Pour 7 cups of water into pot. Add beans and bring to boil for 10 minutes. Turn the heat to low and simmer for 90 minutes or until beans are tender. Season with lime juice, salt, and pepper. Garnish with a dollop of yogurt and some grated lime zest. I imagine it would be pretty tasty to eat with toasted corn tortillas but since I don't normally have that at home, lavash is pretty good too (as seen in photograph). On a few recent trips, I've gotten into the habit of searching out locally-made candies/cookies that are not readily available outside of the area. In the age of national big brands, many of these treats are getting harder and harder to find. However, since most of them have a long history, they often evoke nostalgia and fond memories from locals of a certain age. That just makes my search all the more interesting. It's not just about seeking out some obscure candies. In fact, the reaction and enthusiasm from everyone I speak to is what transcend this experience from shopping to traveling. 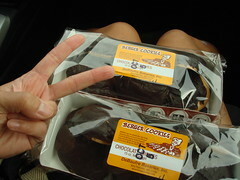 Berger Cookies is a Baltimore specialty, Berger Cookies. 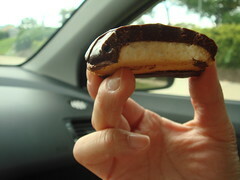 It's a shortbread cookie covered with an equally thick dark chocolatey fudge topping. Yum! Our quest to find Berger Cookies was an adventure. On our way back from a road to Maryland for some crabcakes in Kent Narrows, I suddenly remember reading about these cookies some time ago. I first thought we could find them in any old gas station...but totally came up short. The clerks had absolutely no idea what I was talking about! Fortunately, a customer over-heard our conversation and described the cookies in detail so at least I knew they really do exist. Next we went to a large supermarket...once again, to no avail. I asked a store clerk about the cookies and his enthusiastic reaction amused me to no end "OMG, they're great! No, we don't have it at the store." and then proceeded to direct us to another supermarket in the area. I was jumping up and down in joy when we finally locate the elusive cookies! It was quite an adventure trying to find these cookies. Was it worth the effort? A resounding yes! Now I understand that dreamy expression on the man's face at the mere mention of these cookies. Searching out Chick-O-Stick in Houston was equally amusing if not as adventurous. 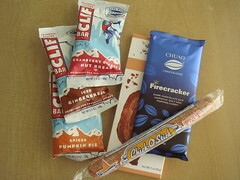 A few days before I were to travel to Houston, I read an article on regional Halloween candies. Pearson Nut Roll is one of my favourites since tasting it at a post-marathon buffet in the Twin Cities in August. Seeing that the author has similar taste, I trust his recommendation for Chick-O-Stick would be equally worthy. Besides, you can't go wrong with the combination of coconut, peanut butter, and honeycomb...flavours that I just can't refuse. If I'm not much mistaken, my next candies adventure will lead me to South Carolina. I wonder what awaits me there?